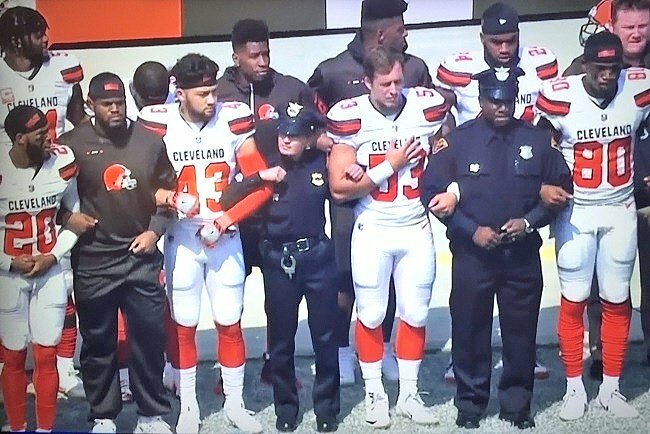 The Cleveland Browns locked arms with police and members of the military before their NFL opening game in a show of solidarity with law enforcement. The patriotic gesture followed months of controversy spurred by unemployed quarterback Colin Kaepernick, who refused to stand for the national anthem at NFL games. Kaepernick, a supporter of the anti-police Black Lives Matter movement, claimed he’s protesting police brutality against black people. Football fans — disgusted by the divisive politics that have infiltrated the NFL — applauded the Cleveland Browns’ show of unity. Before the game, the team also ran through the stadium tunnel with police and members of the military before standing together for the Star Spangled Banner. Two weeks earlier, 12 Browns players sat out the national anthem in protest. Meanwhile, Seattle Seahawks defensive end Michael Bennett refused to stand for the national anthem before the Seahawks’ opener against the Green Bay Packers on September 10. Two weeks earlier, he was detained by Las Vegas police amid reports of gunshots in the area. Bennett accused police of racial profiling and has threatened to sue. NFL Hall of Famers Franco Harris and Jim Brown blasted football players who disrespect the American flag and the national anthem, saying it’s stupid, un-American, and unprofessional. “I’m an American. I don’t desecrate my flag and my national anthem,” Brown said. Colin Kaepernick has struggled to land another lucrative NFL contract after opting out of his 6-year, $114 million contract with the San Francisco 49ers in March 2017. Race-baiting leftist grievance mongers blame racism in the NFL for Colin’s unemployment. Meanwhile, no group has created more black millionaires than the NFL. Sports journalist Jason Whitlock, who’s black, said Kaepernick is unemployed because he’s a mediocre quarterback. Race has nothing to do with it, especially since 70% of NFL players are black. Kaepernick started to become more political after he began dating his current girlfriend, Nessa Diab, a militant black-rights activist who is Muslim. Like many hypocritical liberals who are all-talk, no-action, Colin did not even vote in the 2016 presidential election. Yet he’s being lionized by the left for his “political activism.” The operative word in activism is ACT. Not sit.